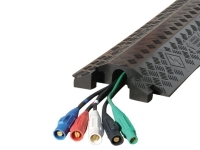 Cord covers, ramps and protectors are a necessary part of setting up your electronic connections. These products protect your wires and cables from damage that is inevitable with gadgets, such as pedestrian movement and vehicular traffic. Failing to protect your cables can result in damaged merchandise and increased repair or replacement costs. 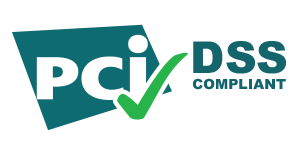 For this reason, it's more effective and cost-efficient in the long run to invest in proper cable and cord protection. At CableTiesAndMore, we offer a wide range of cable covers that vary in size, material and density to suit your coverage needs. Some of our products include heavy duty cable protectors, medium duty cable protectors, light capacity cable protectors, drop over cable protectors, plastic cable protectors and carpet cable protectors. We also offer ADA compliant cable protectors, cable bridges, Connectac wireways, cross-link bridges and the Chewsafe™ line for pets. Heavy duty cord covers and heavy duty wire covers are a great option if you are looking to protect cables and wires in a more externally-traumatic environment. Intense pedestrian and vehicular traffic need heavy duty floor cable covers to withstand the frequent weight being applied in order not to damage them. Heavy duty cable covers are therefore best used for active outdoor locations like busy streets and intersections. 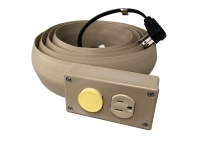 Medium duty cord covers are another great option for protecting cables from heavy foot traffic. A little less durable than heavy duty cable ramps, medium duty cable covers and medium duty wire covers are a great choice for pedestrian-crowded places like schools, shopping malls and parks. Medium duty floor cable covers and medium duty floor cord covers protect the appliances needed, without causing disruption in pedestrian movement. 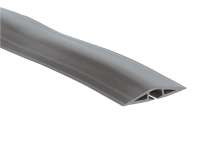 Alternatively, rubber duct cord covers are another medium capacity option. Light capacity cable covers are the ideal option for areas with lighter traffic and less external trauma, such as offices and homes. 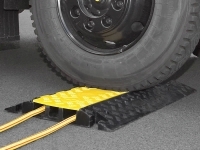 While medium duty cable ramps are able to withstand small amounts of vehicular movement, light capacity floor cord covers and light capacity floor cable covers are meant for less aggressive environments. Because of their thinner density, light capacity wire covers are designed with appearance in mind. They are easy to assemble and aesthetically pleasing, making light capacity cable ramps the perfect indoor option. Plastic cord covers and plastic cable ramps are another option for homes and offices. Plastic cable covers provide a similarly attractive appearance as light capacity cord covers, while also being cost-efficient. While plastic floor cable covers protect a large amount of wires, plastic wire covers for walls are also available (and convenient). 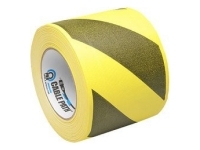 Tape and carpet cable covers offer a unique and flexible option for protecting cables abd wires located inconveniently. 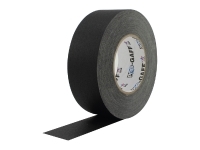 Tape and carpet wire covers come in handy when cables lie on fabric surfaces. Any other hard-surfaced covers, such as plastic floor cord covers, can be unsuitable and unattractive. 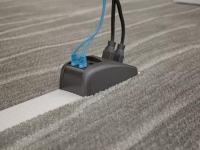 For this reason, carpet floor cord covers and carpet floor cable covers are especially popular options. Flexibility is another perk of using carpet cord covers, as the material is not nearly as rigid as other varieties. For these reasons, carpet cable ramps are an ideal option for many. Drop over cord covers are an easy and no-fuss way of protecting your cords and wires. 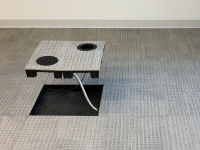 Dense enough to stay in place while also being easy to install, drop over cable covers provide quick and simple protection for your floors. This makes drop over floor cord covers and drop over floor cable covers the ideal choice when looking for fast and convenient solutions for shielding your cables. Drop over wire covers are also available in a variety of materials to suit whatever environment you need them for. A similar option to drop over cable ramps is cable bridges, covering floor cables just as easily and conveniently. Cord and cable covers that are accommodating with the American with Disabilities Act (ADA) are especially important in keeping an environment inclusive. All of our cord covers in this section offer excellent protection while remaining ADA compliant, easily withstanding heavy vehicular and pedestrian traffic. Connectrac wireways are the perfect solution to protect wires in AV, telecom or power connectivity. They are meant for floor and carpet surfaces, blending in seamlessly while keeping cables organized and centralized. Connectrac wireways are sourced from resilient aluminum and maintain a low profile, making them a versatile and reliable option when choosing cord covers. AMS Cable protectors also known as cross link bridges can be considered the most customizable structure of cable covers. They are perfect for situations where wires and cables are constantly being changed in location, such as events and productions. They are designed to have connectable sections that can conveniently latch onto one another, depending on how large or vast the cable cover needs to be. Despite their versatility, they remain durable and manage to keep cables neat and organized. The ultimate in home cable protection technology, the Chewsafe™ line of products we offer are engineered to make cords and cables virtually unchewable for pesky teething pets. They provide a citrus scent and a bitter taste to deter pets from chewing, protecting both the cables and the pets from any harm. Made from heavy gauge medical grade tubing, these cable protectors are a fantastic solution for in-home cable protection.